The EC can be expressed using a number of different units, but the typical unit is siemens per square meter per mole (S/m2/mole) or millisiemens per centimeter (mS/cm). The mS/cm unit is generally used in Europe as a guide to concentration of nutrients in water. In North America, the conductivity is converted into a count of the ions in the water using parts per million (which can also be given in many units including ppm, mg/l etc.). This is done by converting the EC into a value based on knowing the content ions of the solution. 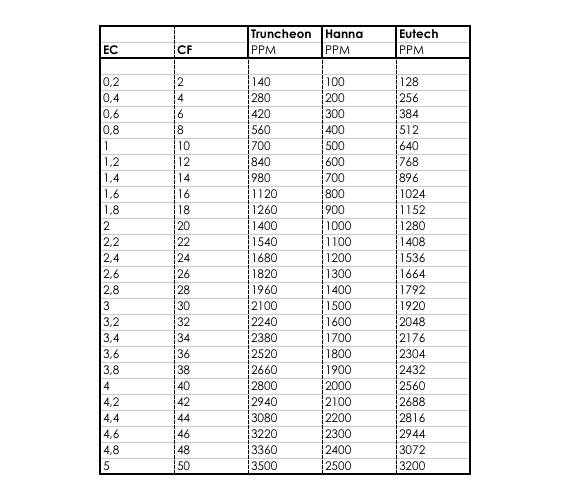 Fortunately, there is a fixed calculation for the relationship between these units, which is given in the table below. 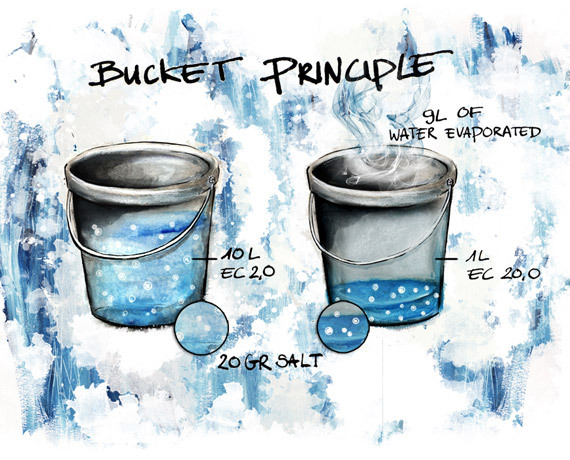 Salt has the property of seemingly attracting water to itself, a process known as hydrolysis. A pot of salt placed in a cellar will reduce the atmospheric humidity there. 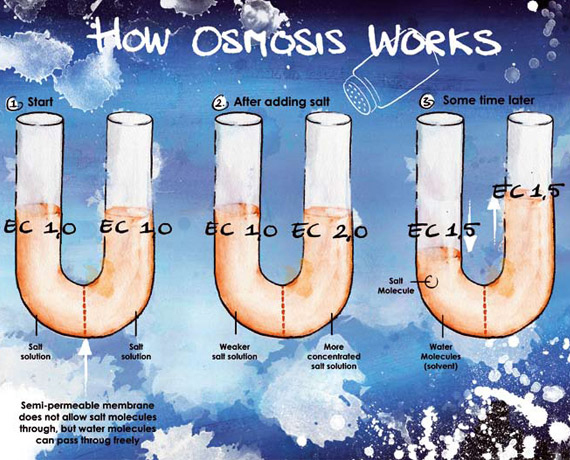 In a solution, the concentration of salts will always try to equalize across two different regions of concentrations by water movement to the area of higher concentration. This difference in concentrations is known as the Water Potential Gradient. This property also plays a role in our cultivation through a process known as Osmosis which involves a semi-permeable barrier that allows water to pass but restricts ion or salt movement. When we give a lot of nutrients (high EC) the nutritional salts attract the water in the substrate to themselves. This makes it more difficult for the roots to extract the water from the substrate. So it is even possible for us to create conditions in a damp substrate in which the roots are no longer capable of extracting any more water from the substrate. This is known as making the substrate “physiologically dry”. This results in the plants having no more water available for transpiration (evaporation) to cool themselves against the heat (= light). Even though this is commonly referred to as over fertilization it is actually a shortage of water. With cut flowers such as roses, or with cuttings, a higher EC in the vase or the plug for the cutting can literally draw the water out of the stems. We can see this osmotic process in a U-tube when we separate the two sides with a permeable membrane such as a piece of stem. If we now add some salt to one side the water level on this side will rise because the water with a lower EC will be drawn toward it. This is why we recommend that very little or no nutrients. Salt has the property of attracting water molecules. When you add salt to the water in the right half of the tube (thus increasing the EC-value), the salt molecules will attract water molecules from the left side which has less salt. The water level on the right side rises until the the EC-values (salt concentrations) of both sides are equal again. By achieving this positive spiral of EC build-up in the plant, the plant also becomes more capable of absorbing water and retaining it. Because of this the plant doesn’t allow its water to evaporate very easily so it won’t lose the water that it has absorbed too soon. With plants that are too soft the intensity of the light will have to be reduced or the number of hours of lighting will have to be shortened to prevent a shortage at the end of the day. Even though EC plays an important role in this story it isn’t the only factor that has an influence here. The total climate control around the plant influences the processes that EC is a part of.